Hi, my son has gone missing, and I wanted to check to see if maybe he had been brought in. Reporter: It's a scene played out in homes across the country. A terrified parent desperate to track down his drug-addicted child. There's no one by the name, sir. Thank you. Reporter: In the movie "Beautiful boy", Steve carell plays a father whose son is addicted to crystal meth and he will stop at nothing to get him help. This isn't us. This isn't who we are. I'm really sorry, dad. Nick, what you have, you're going to find it again. You're going to get it back. You watch your kids go through something like this and spiral out of control and to be completely helpless. That's the part of it that is the scariest. Reporter: The addiction nearly destroys his seemingly perfect family. The whole point of the movie is to exemplify to people this can happen to anyone, and not to terrify or scare, but it's redemptive. Reporter: The movie is a painfully true story, based on the memoirs of David and Nick Sheff. It opened the door to so many people who were experiencing similar things. Because it was considered shameful, they were suffering in silence. And it opened the door to communication. And the idea of having the movie is bigger. One day I woke up in the hospital and somebody asked me, what's your problem? And I said I'm an alcoholic and addict. Reporter: "Beautiful boy" puts a face on the epidemic ravaging the nation. In 2017, an estimated 72,000 people died from drug overdoses. I would never wish these hellish experience on anybody. But sometimes people get sick. Reporter: At Nick's lowest point, he was living on the streets, willing to do anything to feed his addiction. The thing I regret the most is, you know, stealing the money from my little brother. I don't remember a lot of things from that time. But I remember so clearly waking up and jasper was asking where his money went, and I don't remember taking it, but I knew you know, that I'd taken it. I was hijacked by the drugs, and I didn't want to be acting the way I was acting, but I couldn't stop. I didn't know where he was when he was on the streets. There were nights I didn't sleep. One time he called, so I was relieved to know that he was okay, that he was alive. Reporter: That phone call led to this San Francisco diner, their reunion painfully recreated in the film. Where does this end? It became clear at one point, that it was not about reconnecting, it was not about going to treatment. It was because he needed money and wanted money. You're just embarrassed because I was like, I was this amazing thing, like your special creation or something and you don't like who I am now. Who are you, Nick? This is me, this is who I am. It was an overwhelming time in my life, and it was overwhelming to watch the movie recreate it, because it was so realistic, and you see that in the movie. You see Steve carell's face and that he is so sad and broken. I want you to be proud of me. Reporter: The emotional days on set took a toll on the actors. I would go home at the end of the days and want to call dad and just say I love you. And be grateful that we have one another. Reporter: Carell says coming home to his wife of 23 years, Nancy, made it easier. Every day, I'd sit with my wife, and I would tell her about what we felt during that day. It was good to talk about it. Because it does get inside of you. And especially a topic like this, when you're looking at your kids when you come home, and you just love them so much. And you pray that nothing bad ever happens to them. Reporter: "Beautiful boy" is the latest dramatic role for carell who became famous for "The office". And is known for his comedic movies like ""Anchor man" and the 40-year-old virgin. What drew you to this role, Steve? It's something that I felt people needed to see. It's a national epidemic and tragedy. Reporter: As for shal may, he auditioned before the performance in "Call me by your name." I auditioned many times for this. I really didn't have any sort of career when I was going up for this. It was still very much a job of like trying to keep your cool on set. Reporter: "Beautiful boy" is generating Oscar buzz for both carell and shal may. Their portrayals so realistic, it was difficult for David and Nick to watch. It's heart breaking to watch their performances, because it feels, they capture the emotion in a way that is eerie, it's so real and haunting. Watching it broke my heart. Even though it was so painful, horrifying to watch because it felt so real, it also made me feel so grateful for, I mean, the fact that I'm alive. For the fact that I get to be here sitting next to my dad. Reporter: For the sheffs, this movie is a stark reminder of how far they've come. There's absolutely no reason that I survived when other people didn't. But I guess the thing is, is that as long as there is life, that's when there's always hope. Reporter: After years of relapsing and going in and out of treatment, Nick has been sober for eight years. My life has gotten so much better since getting sober. And, you know, I've seen it with so many friends and people I work with, that when they get sober, they get the lives that they've always wanted. But your life can really just blossom and get so much bigger than it ever had been. Reporter: A life leading others towards the light. People tell me that they do get solace when they've seen the movie. Maybe it's because there is a recognition for how hard it is to face this disease. There's a sense of, you know we're not alone. Reporter: For "Nightline," Paula Farris in New York. "Beautiful boy" is in theaters everywhere. 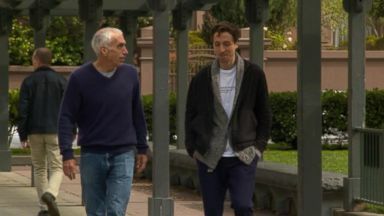 "I hope the movie can help people," David Sheff, the father who helped his son through drug addiction says of the new film based on their story. 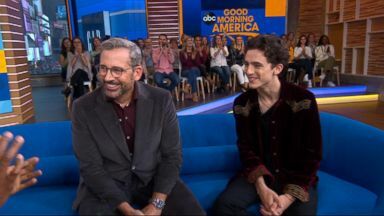 Chalamet, Carell speak out on "GMA" about their new movie, "Beautiful Boy"